Old Brampton lies on the ancient road westward across the moors; for many centuries this was the only way from Chesterfield to Baslow and beyond. There has been a church here since at least 1100. For most of that time it was the centre of a huge parish which included Holymoorside and ran right up to the western edge of Chesterfield, but in 1832 St Thomas’ Church was built in New Brampton and took away the eastern and southern parts of the old parish. The church is a Grade 1 listed building, built from local sandstones, and stands in a large churchyard surrounded by trees, which makes a very attractive setting. 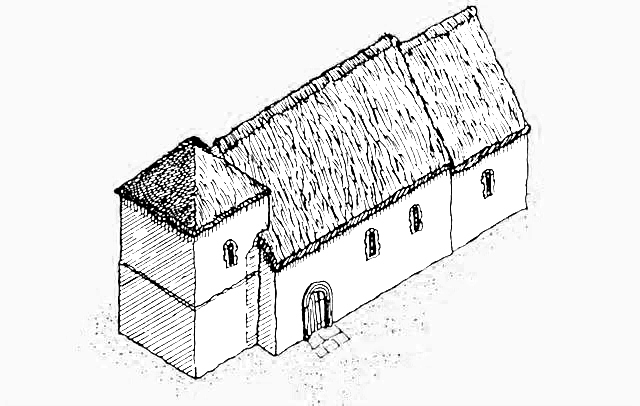 The building in the 1100’s was probably very simple indeed – a high, steep-roofed nave, with a small sanctuary beyond, and at the west end a low, strongly built tower, covered by a pyramidal roof to throw off the rain. Inside, there would probably be no pews, and tiny windows would let in only a dim light. The walls would be plastered and there was probably a huge painting of the Last Judgement on the east wall. The tower walls are the only part of this church which survives. In winter it must have been cold and dark, but it was the one building in the parish where a large number of people could gather for a common purpose, and it must have played an immensely important part in their lives. This simple church was dramatically transformed between 1200 and 1300. 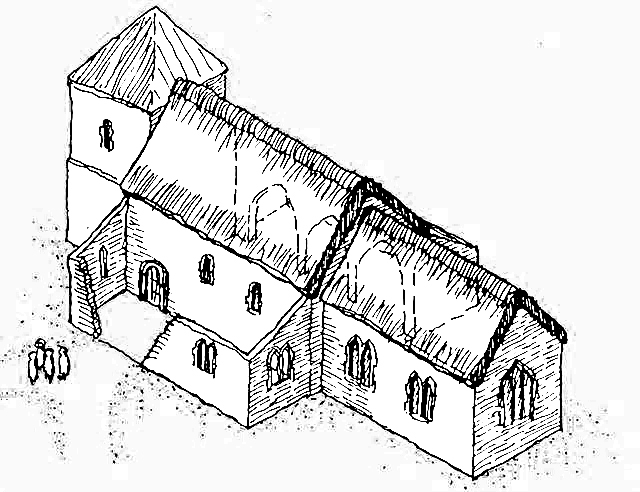 The north and south aisles were added, the chancel was enlarged and soon after 1300 the tower was raised by an extra storey and the broach spire and porch were added. The spire is still a striking landmark, visible from many parts of the parish and beyond. We must assume that there were wealthy families locally who helped to pay for all this. One such was the Caus family, and there is a fascinating memorial at the back of the nave to Matilda Le Caus, who died in 1224. With its new aisles, the church was now much larger, reflecting a growing population on the farms and hamlets round about. 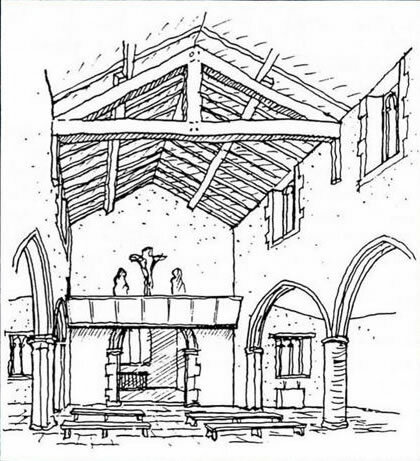 The Church in the thirteenth century - a new chancel has been added and the south aisle is being built alongside the Norman nave. Some time after 1400 the last great structural changes took place. The church was as broad then as it is now, but poorly lit, so the nave walls were raised to allow the high clerestorey windows to bring in much more light; at the same time, with glass becoming cheaper, all the windows were enlarged. 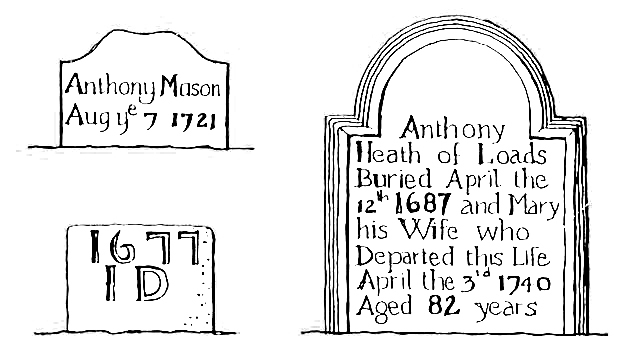 By now there were probably benches or simple pews, and there was a rood loft across the chancel arch, with figures of Christ, Mary and Saint John – you can still see the doorway that led on to the loft in the north wall of the nave. The nave was the people’s village hall and social club as well as their place of worship; dogs were allowed in provided they behaved themselves. 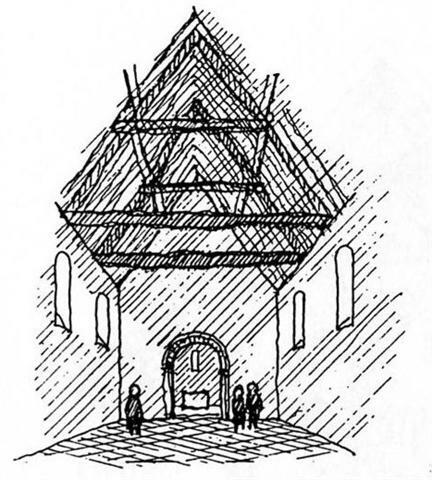 At the Reformation, the rood loft would have been stripped out, the wall paintings whitewashed over, and the church became a very plain meeting house. In the 18th century, box pews were put in, with galleries at both ends of the nave, but by the 1820’s it was all in a great state of decay. Everything was stripped out and the building altered and restored, but the work was very unsound. The two nave pillars nearest the chancel were taken out and huge arches built to span across - you can still see them, but they soon became unsafe and by 1870 the church once again needed restoring. This time the two pillars were put back, the lovely archway into the tower, which had long been blocked up, was reopened, and the present pews were put in – the church began to assume its modern appearance. For most of its history the outside walls of the church would have been plastered, like those of Brampton Hall on the other side of the road; the inside was plastered too, until it was stripped off in the 1930’s. The attractive oak choir stalls were added in 1938 to commemorate Thomas Linacre, who was born at Linacre Hall nearby; he became a great scholar, and Physician to both Henry VII and VIII. Repairs and restoration continue – in 1997 the spire, tower and porch were repointed and in 1999 a handsome new timber roof was installed in the north aisle. In 1897, to celebrate Queen Victoria’s Diamond Jubilee, a new clock, which still strikes the hours, was placed on the tower. 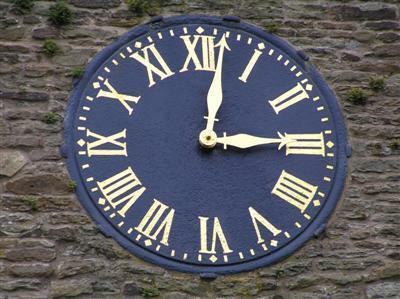 The face is unique – it has 63 minutes, rather randomly arranged round the dial. Nobody knows how this came about, but The George and Dragon pub, opposite the church, may have some connection! 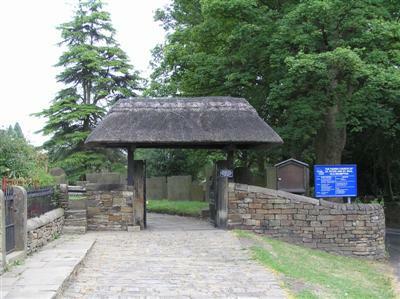 The thatched lychgate at the top of the churchyard is over 100 years old. In 1997 the oak posts, which had rotted, were replaced, using timber from a tree in Kent which had fallen in the Great Storm of 1987. A fully illustrated Guide is available in the church, giving more details.